Animal cells are typical of the eukaryotic cell, enclosed by a plasma membrane and containing a membrane-bound nucleus and organelles. Unlike the eukaryotic cells of plants and fungi, animal cells do not have a cell wall. This feature was lost in the distant past by the single-celled organisms that gave rise to the kingdom Animalia. Most cells, both animal and plant, range in size between 1 and 100 micrometers and are thus visible only with the aid of a microscope. Plant cells are of three basic types namely, parenchyma, collenchyma and sclerenchyma. These cells have different structures and perform varied roles in the overall functioning of the plant. Which of the following is a mitochondrion? Which of the following cell structures is the site of photosynthesis? The chloroplasts are so-named because they contain chlorophyll, the molecule that plays a major role in the process of photosynthesis. Which of the following statements correctly describes a difference between plant cells and animal cells? Plant cells are surrounded by a cell wall. Animal cells are not. In what cellular function does the structure shown here play a role? Which of the following is nicknamed the "powerhouse" of the cell? Which of the following is the best description of the process shown in the image below? Water and carbon dioxide plus light produce oxygen and glucose. Which of the following is NOT a necessary input for the process of photosynthesis? Where within the cell does photosynthesis take place? Which item listed is NOT produced in the process of cellular respiration? Where within the cell does the process of respiration take place? Which of the following can be used to measure the rate of photosynthesis? According to the graph below, what temperature will result in the highest rate of photosynthesis? Based on what you have observed in the Gizmo, which of the following chemical equations represents photosynthesis? Carbon dioxide plus water yields glucose (sugar) and oxygen. A scientist wants to determine the best light wavelength for growing plants. He grows plants in four test groups as shown in the table below. What, if anything, was wrong with the experiment? He should only change the wavelength of light for each group. If chlorophyll were red instead of green, making plants red in appearance, which color of light would you expect to produce the LOWEST rate of photosynthesis? What is the structure labeled with an arrow? Which statement best describes a cell? The smallest structural and functional unit of an organism that can be said to be alive. 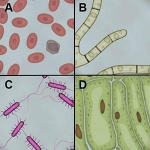 Which of the samples shown below are eukaryotic? What do the following results from the TEST FOR LIFE tab indicate about the sample? Meiosis is A type of cellular reproduction in which the number of chromosomes are reduced by half through the separation of homologous chromosomes in a diploid cell.